EMBED TECHNOLOGY INTO THE CLASSROOM! The article addresses the history of New Year's celebrations. 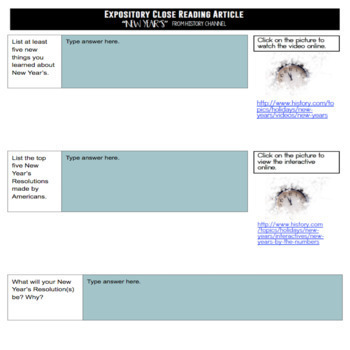 This is a must have item to start the new school year and allow students to practice close reading of nonfiction text! The new Common Core has an increased focus on non-fiction, informational texts in the ELA classroom. 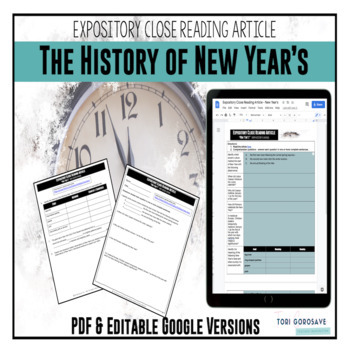 This easy-to-deliver non-fiction activity about the history of New Year's is designed to be uploaded to Google Slides and shared with your students in Google Classroom. Included in this purchase is an explanatory PDF with a link to the digital document. A print version is also included for your convenience. *Completely paperless! No Printing! No Cutting! No Glue! No Lost Notebooks! *Students work directly on student pages. *More engaging for students often unwilling to write or participate on traditional assignments. *Meets technology standards and prepares students for college or career. 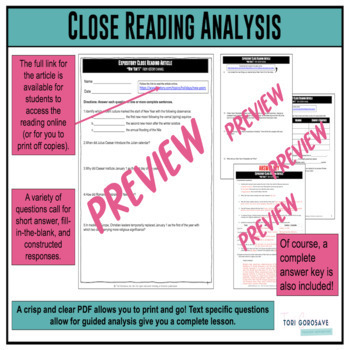 *Ideal for the 1:1 school or those incorporating technology use in lessons. 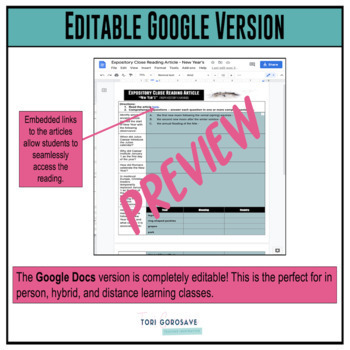 *Perfect for organization of all student materials in their own Google Drive! *All materials are always printable if needed! *Allows students to work on assignments anywhere they have access to their Google Drive. Save over 40% off individual sets and buy the growing bundle of expository articles!